At least six people have been killed in widespread protests in the Democratic Republic of Congo, United Nations sources say. Protesters are demanding that President Joseph Kabila – whose expected term of office expired more than a year ago – should step down. Police have used tear gas to disperse protesters in Kinshasa, where UN peacekeepers have been deployed. Similar demonstrations three weeks ago led to a number of deaths. A spokesman for the UN mission to the country said about 50 people were injured in Sunday’s clashes and that dozens had been arrested. Jean-Baptise Sondji, a former minister, told AFP he had witnessed the death of a 16-year-old girl outside a church in the Kitambo area of the capital. “An armoured car passed in front of the church. They began firing live bullets, I protected myself… a girl who was at the left side door of the church was hit,” he said. The widespread marches had been called for by the country’s Catholic Church, which appealed for a large but peaceful demonstration. The Congolese authorities, however, banned the marches and no formal permission was given. On Saturday evening, internet access in the capital Kinshasa was cut. Many demonstrators carried rosary beads or other religious icons as they marched. Despite the ban, protesters gathered after morning Mass on Sunday to march through the streets, accompanied by members of the clergy. 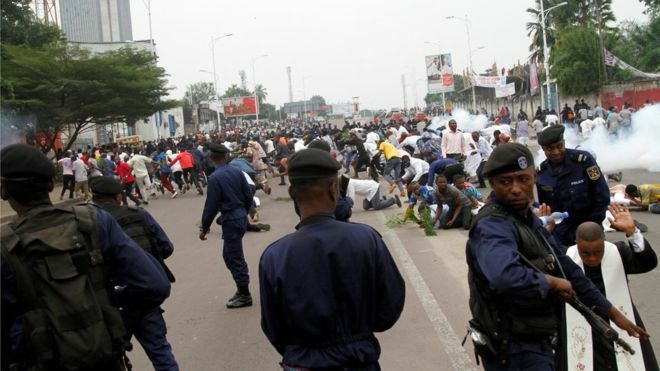 Local media outlet Radio Okapi reported protests in Kinshasa, Kisangani, and Bukavu. Other cities remain quiet, it reports, though a heavy police presence has been seen in many places. Radio Okapi also later said that one of its journalists had been wounded by a bullet in the Lemba district of the capital. The UN mission in the country – which has been running continuously since 1999 – said it deployed its troops to the streets to observe and record any violence. President Kabila has been in power since 2001, and was supposed to step down after his second and final term came to an end in 2016. Under a deal reached more than a year ago, he was due to step down by the end of 2017 – but that has not happened. Instead, the election to replace him, originally planned for 2016, has now been delayed until December 2018. The country’s powerful Catholic Church has been a voice of opposition to Mr Kabila. The Church also called for the demonstrations in late December which led to at least seven deaths, according to UN peacekeepers. Dozens were arrested in the aftermath of those protests. “If they decide to repress, there will be no peace. But if they let the march take place, they will respect the constitution and peace will prevail,” he said. DR Congo’s evangelical Christian churches also lent their support to the march organised by their Catholic counterparts.